October 6, 1965, the first game of the '65 World Series, the Los Angeles Dodgers versus the Minnesota Twins. It's Yom Kippur night at Metropolitan Stadium, 47,797 in attendance. Sandy Koufax, lead pitcher of the LA Dodgers, refuses to play. 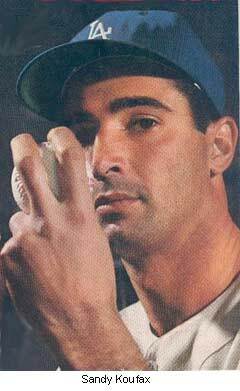 Koufax's refusal to pitch on Yom Kippur gained him the respect and admiration of many Jews. His courage gave many Jews the strength to not be ashamed of their Judaism. The day after Yom Kippur, Koufax received a visit in his S. Paul hotel room from Rabbi Moshe Feller, regional director of the Merkos L'Inyonei Chinuch — the educational arm of the Lubavitcher Hasidic movement. Feller congratulated Koufax for not playing on Yom Kippur and for "the great assist he gave Rabbis and Jewish educators the world over." Rabbi Feller also brought Sandy a pair of tefillin. "Since you bat right and throw left," he told the pitcher, "I wasn't sure what type to get you." (Tefillin are worn on the weaker arm — right-handed people wrap them around their left arm, and lefties on their right arm.) "But considering what your left arm has accomplished, I decided to get you the type you put on your right arm." Koufax accepted the gift and thanked Rabbi Feller for visiting. "The Talmud says that tefillin is representative of all the Mitzvot of the Torah," Feller later explained. "So I could not think of a better way to honor a person for enhancing Jewish values, than by presenting him with a pair of tefillin." Two weeks later, at a Simchat Torah gathering, the Rebbe, Rabbi Menachem Mendel Schneerson, of righteous memory, spoke about the Jewish pitcher who refused to play on Yom Kippur (the following is a free translation from the Yiddish). "The first condition in influencing a child," said the Rebbe, "is that the child must see a living example by his parents. If the child sees the parent studying Torah at a time when the parent would otherwise be involved in business dealings, thereby surrendering a few dollars of profit, and perhaps causing that he won't be written up as one of the top dealers — this is an example of self-sacrifice for the child. "There was a young man, and in fact he had a beard, he went to see the pitcher that wouldn't pitch on Yom Kippur and he told him that he does not play baseball on Rosh Hashanah either. The young man told the pitcher that he would like to give him a present. He gave him a pair of tefillin. The pitcher told him that he still remembers tefillin, however, he did not want to put them at that time. The young man left, and that day the pitcher lost the game... But at the end it turned out that he won the World Series, and on his table there were the tefillin. In the end, even 'a distant individual will not be distanced' and he will merit to put them on, and another Jew will be added to those who have donned tefillin..."
Said Murphy to Mulrooney, 'We shall lose the game today! shekoyech koufax sandy koufax is still an inspiration to american jews 40 years later. he gave such chizuk, strength, to american jews because he was a great jewish athlete and he stood up for his people, for the torah and Gd. i don't know if frum people know how important he was for us, and still is.